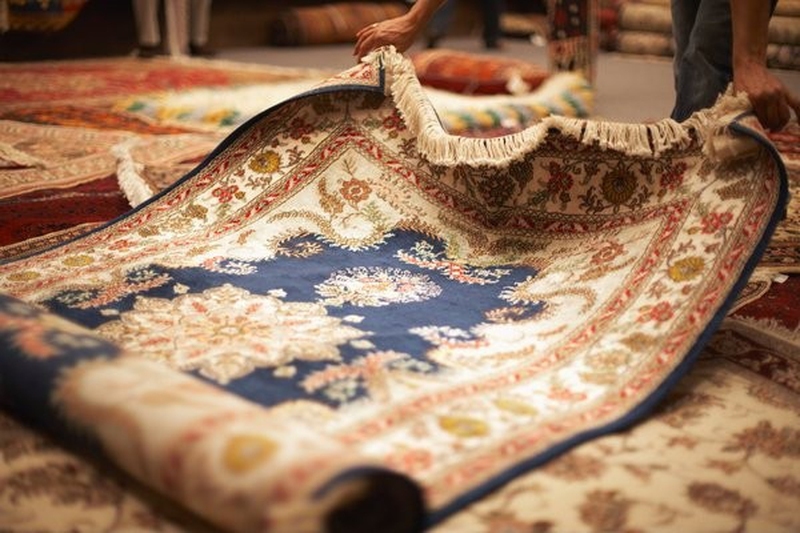 To clean a rug, tend to all spills and pet stains as soon as possible. Wash the rug in a washing machine unless the tag states otherwise. Remove solid matter. Use a paper towel to remove any solid matter spilled or deposited on the rug, and dispose of it. Blot spills and stains. With a towel or paper towels, blot up as much of the spill or stain as possible. Blot until the stain no longer transfers to the towel or paper towel. Rinse the blotted area. Rinse the area with warm water, and absorb the water with a towel or paper towel. Mix a cleaning solution. Mix 2 to 3 drops of clear liquid dish soap with a cup of warm water. Apply solution to spills and stains. Soak a paper towel or a portion of a towel in the solution, and apply to the stained area. Blot the area again. Blot the area again, and continue until there is no transfer to the towel or paper towel. Rinse the area again. Using warm water, rinse the area again, and blot until dry. Wash in a washing machine. Unless the tag states "dry-clean only," wash the rug in a washing machine using cold water and laundry detergent. Air dry the rug. After the washing cycle is complete, air dry the rug. Never use heat. Server responsed at: 04/22/2019 4:11 a.m.